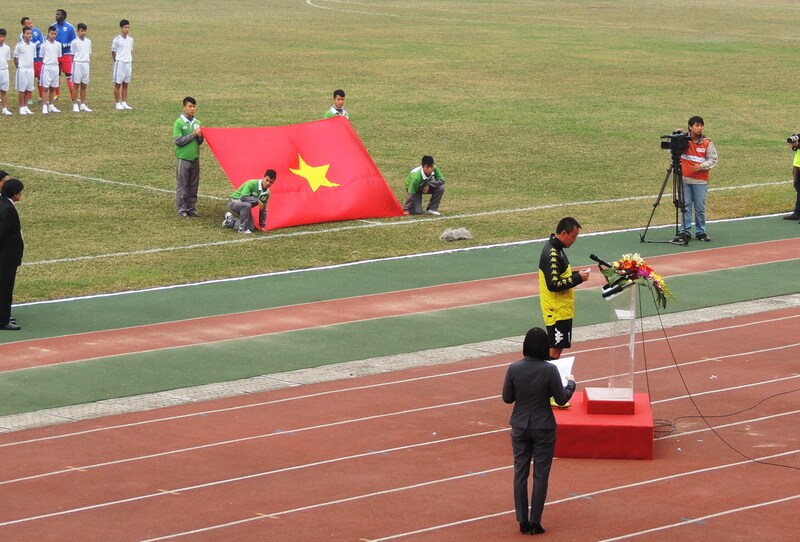 Just 4 months ago, in southern Vietnam, HA Noi T&T were crown 2013 league champions after a win at Long An. Four months ago we celebrated, albeit alone, in the stands of Long An stadium. It’s January 11th 2014 and the season was due to begin again. Enjoying a pre-match coffee, I began wondering what the season would bring; as I noted the deserted streets, it clearly wasn’t going to be a flood of new supporters. Although, the empty streets around the stadium made for a perfect running track for the cadets of the local kung fu club. In a slight hypnotic daze from the extra strength coffee, the continuing passing of the runners and last nights bia hoi consumption, it dawned on me, today was January 11th. I’d arrived in Ha Noi exactly 3 years earlier. Wow! Three years on and I was sat outside a football stadium. This brought a wry smile to my face. Three years and two days previously, I was sat outside The Lamex Stadium, over 5700 miles from Hanoi, about to witness the mighty Stevenage FC beat Newcastle United 3-1 in an FA Cup tie. Champions T&T hosted big spenders, Becamex Binh Duong, in the leagues opening match. Being the opening match it meant the inaugural opening ceremony would be held. Having worked in Vietnamese public schools for a number of years, I’m fully versed in the countries love of a ceremony; there would be speeches and plenty of them. Thankfully, unlike at the schools, there would be no dancing and/or singing. As the players lined up on the field, the speeches began, continued, and continued some more. For 18 minutes in fact. It was cold. With speeches complete, the match ball presented, bouquets gifted and individual red roses offered to each player, the season could begin. I suddenly woke from an 18 minute nap, where I’d dreamt I too was asked to give a pre-match speech, only to realize Coach Hung had opted for Argentinean Striker, Gonzalo, to play in central defence. He played there at the end of last season to great effect, but times were desperate then due to injuries. Pre-season had seen numerous centre halves on trial at the club, with not one, but two, eventually given contracts: Australian Sam Gallagher and Gruica from Croatia. 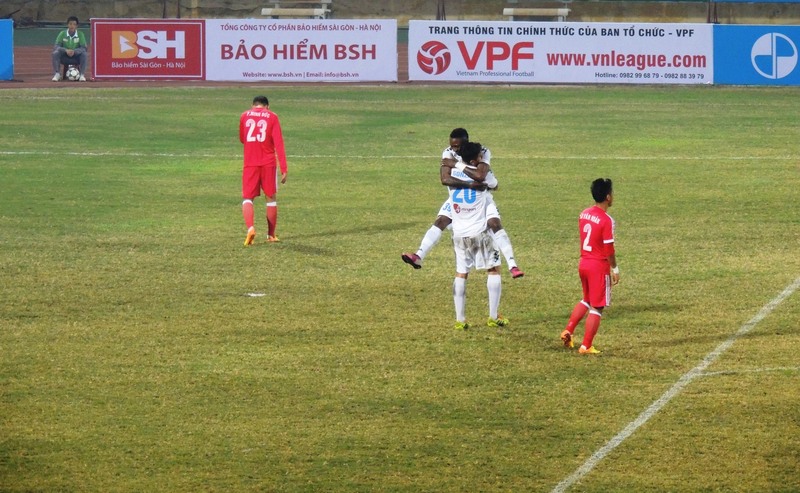 As the game progressed, Binh Duong became more of a threat and T&T failed to gain any rhythm. The team’s shape looked wrong, most notably in defence, as the team struggled with the powerful Binh Duong front men. Eventually, the visitors took the lead through Abass Cheikh Dieng (39’). Hà Nội T&T entered half time a goal down. However, just before half time coach Hung decided to throw on Gallagher in central defence. Gonzalo moved upfront and Thanh Luong was the unfortunate player sacrificed. It seemed the coach, through this substitution, admitted to making a mistake in his starting line-up. Tactically, it was a masterstroke; Samson and Gonzalo instantly linked up exceptionally well and were supported by the impressive Van Quyet and debutant Hector. Ha Noi equalized just a minute into the second half through Hector (46’). 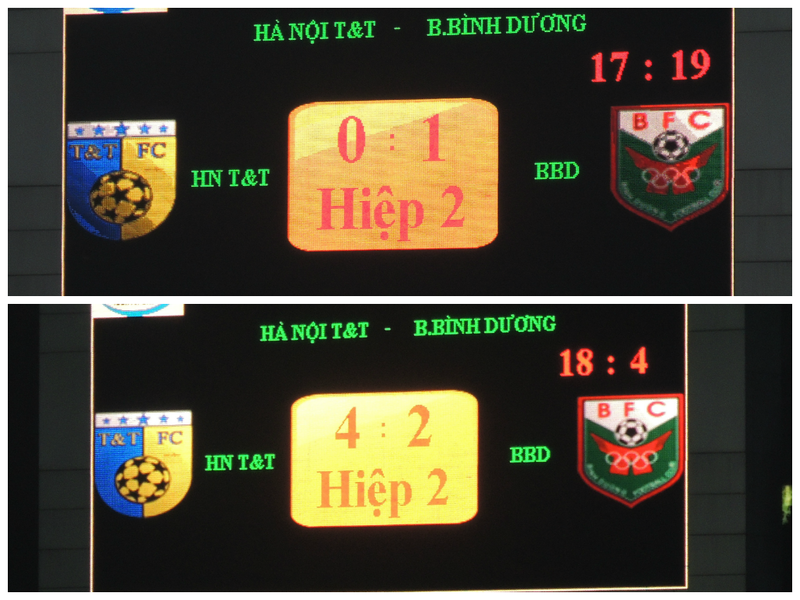 The result was soon out of Bình Dương reach as last season’s joint top scorers tore apart the visitors defence. Firstly, Samson’s fine run ended up with Bui Tan Truong (57′) turning in to his own goal before Samson added his own with a fine finish. Gonzalo (78) struck with a late-deflected free kick from distance to secure the three points. Nguyễn Trọng Hoàng (88’) scored a late consolation. 4-2. During half time, I was glad more fans hadn’t turned up as they’d probably not return. 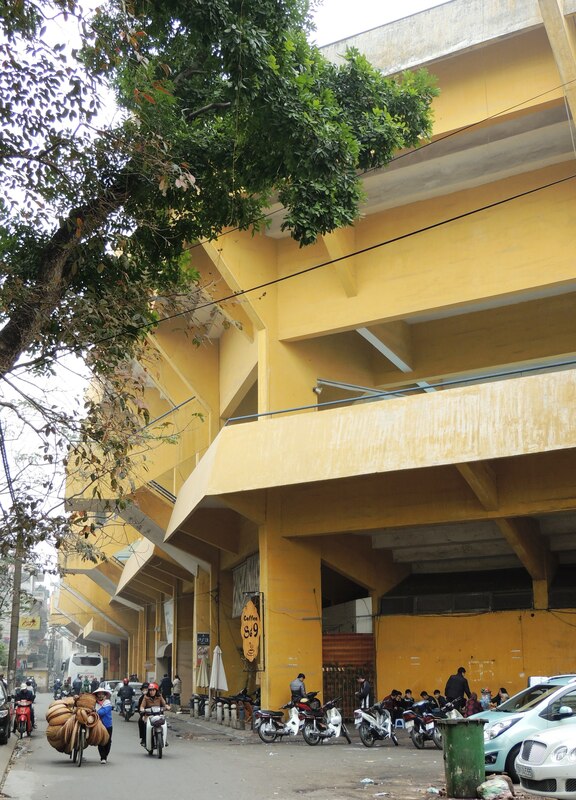 It was though a shame only 3000 fans were present at the Hàng Đẫy stadium to witness an exceptional second half display. Elsewhere there were wins for Sông Lam Nghệ An, SHB Đà Nẵng and QNK Quảng Nam. Thanh Hóa drew at XM Vicem Hải Phòng whilst newly crowned super cup winners, XM The Vissai Ninh Bình, gained a point at Đồng Nai. Click for results and latest table.